Farm to Table? 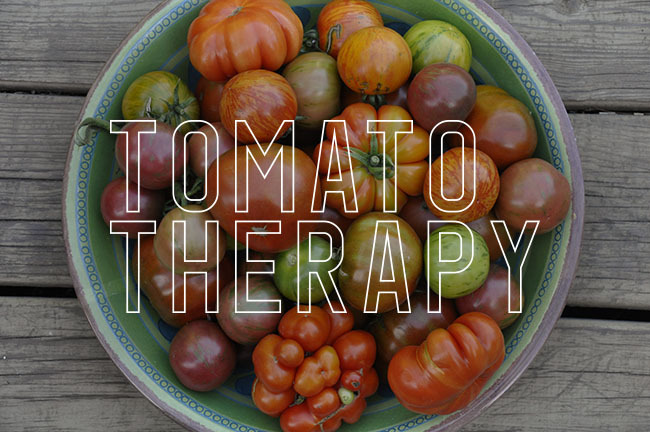 How about: Garden-to-kitchen-to-table. A more realistic, tastier and achievable approach. This past weekend, I've become more than a little obsessed with two books which happened to arrive at the same time from Amazon. The first one, by rock star chef and blogger David Lebovitz, MY PARIS KITCHEN- Recipes and Stories ( not a paid promotion here, I just like it, so I am going to write about it), and the second book - THE THIRD PLATE - Field Notes on the Future of Food by chef Dan Barber. 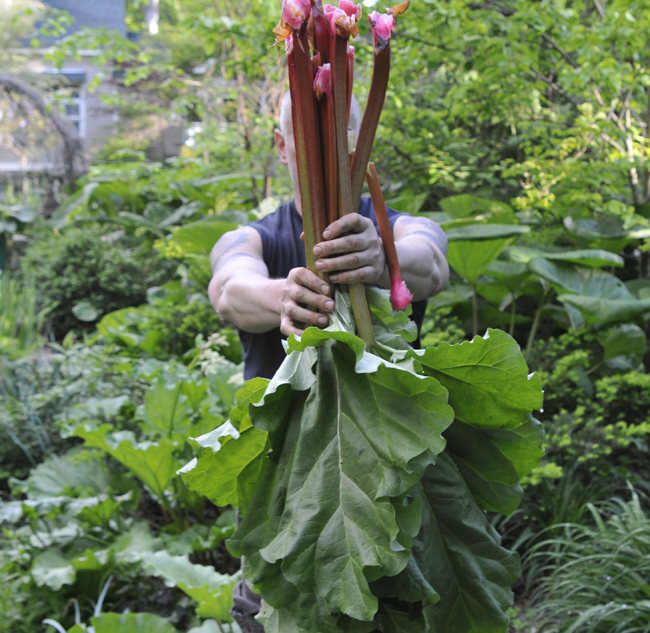 For those foodies out there, you may see the connection here, for those of you who do not…read on (also, I just happened to male Alice Waters' recipe for Rhubarb compote this weekend - everything connects, sometimes). 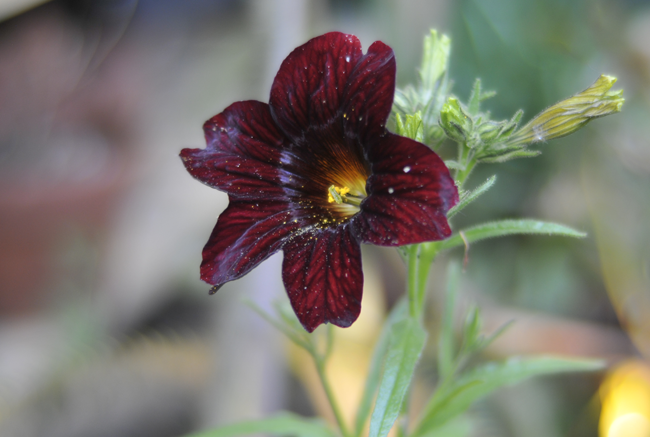 A nearly black Salpiglossis, which self-seeded into a tub where an orange tree is growing, has grown to magnificent proportions throughout the winter in our greenhouse. Almost impossible to grow in a hot and humid New England summer, this old fashioned annual can be grown as a winter pot plant under cool glass, and this is proof. Yes, lots of Guy Wolff pots were added to the greenhouse collection that I started 12 years ago. 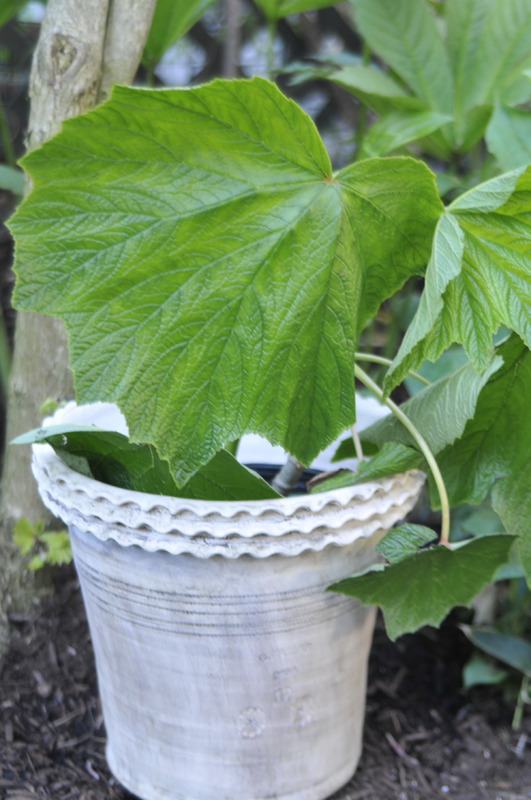 This Begonia grandifolia was also added to the begonia collection. A reader wrote me yesterday, asking me what I had bought while at Trade Secrets, which reminded me about a post that I have been meaning to write - a post that showed some of the plants that have been finding their way into my garden. I always feel funny about over-sharing purchases, as half the fun in our sport of gardening is discovering new things, yet I too sometimes like to see what other gardeners find interesting. Gardening is, and should be personal, but I'll admit that sometimes it's fun to see what lies in someones closet, or, over their garden gate. 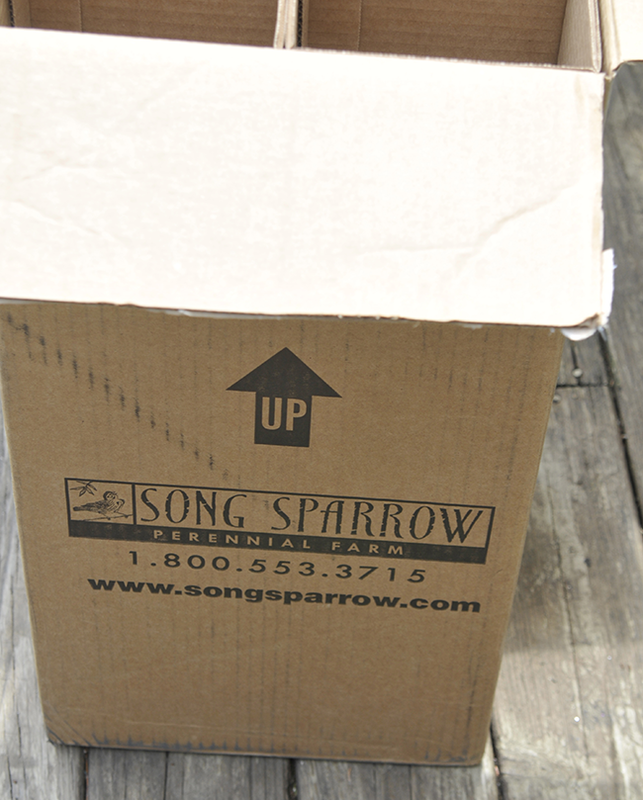 From my dear friends at Annies Annuals, came this box - so perfectly packed that one could almost find it hard to believe that this box traveled across the entire country. 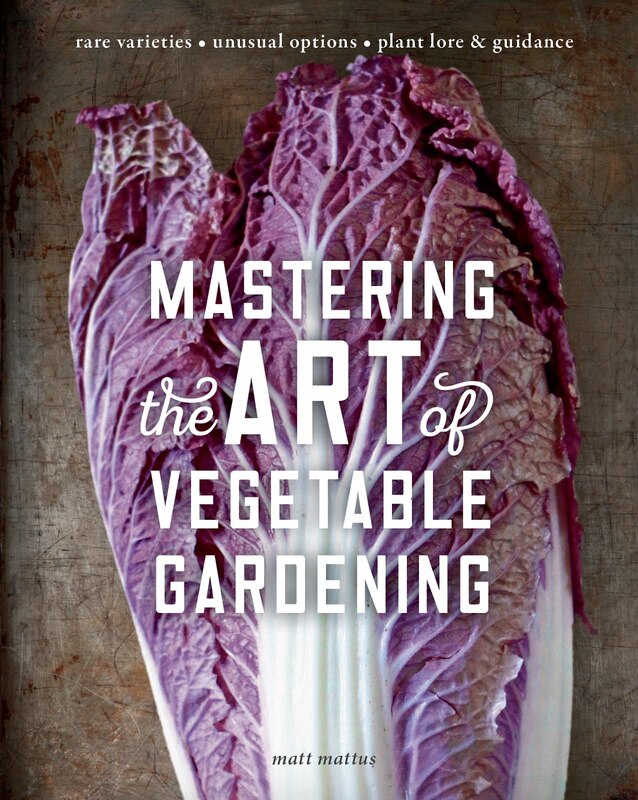 Are you guys all freaking out about planting your vegetable and flower gardens? It’s nearly Memorial Day weekend and I feel so far behind, but no fears – there is still plenty of time to catch up and breath. 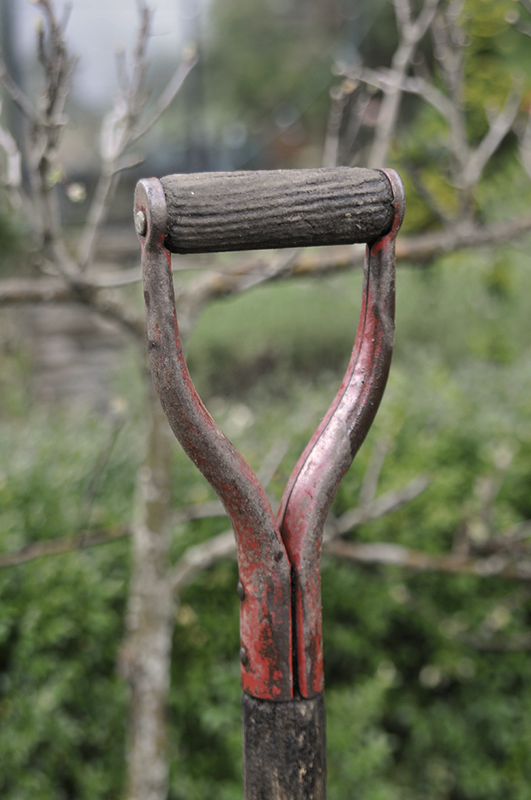 It’s so easy to get caught up with life, that tasks like digging a veg garden, or planting the perfect container, even cutting the lawn before it rains again can just seem overwhelming. Relax. We all do it, and if there is one thing that I am really trying to do this year, it is to cut myself some slack with all the duties – after-all, life if FULL of duty, and the last place we need any more in in the garden ( unless, of course, it is some nice, fresh cow duty). It’s time for a little encouragement folks. I too am out of control with my plant purchases, barely able to keep up with nursery pots that keep ending up near the deck and hose. How will I ever be able to plant everything in time? The truth, they will all make it into the ground in time (Except, of course for that yellow English Oak that I bought last May at Trade Secrets 2013! But it emerged unscathed last week, so it is finally being planted in). We all do it.There was a time when I used to wonder why anyone would order annual from a mail order catalog, especially from Annies Annuals, as I figured that I could simply grow them myself, but did I ever learn my lesson. 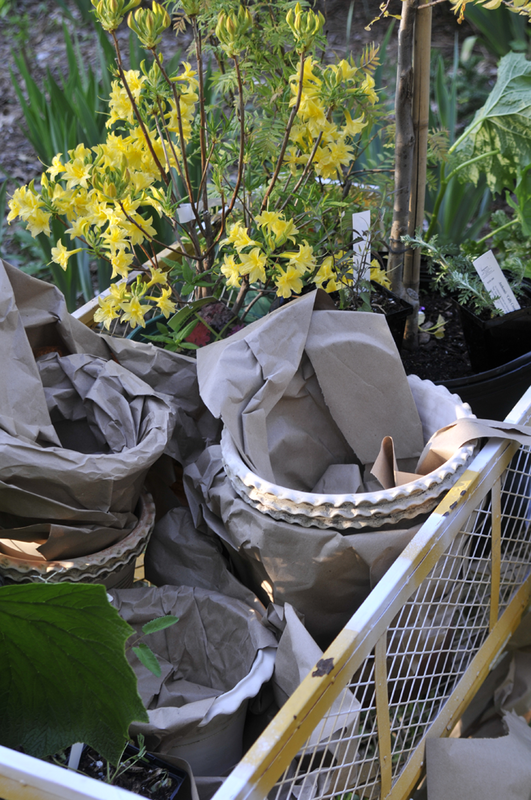 A couple of years ago, I decided to order some of her more unusual annuals ( they offer far more than annuals), such as Godetia and some Clarkia - and the plants arrived in such a well packed box, and grown with such care, that I could hardly believe it. Four inch pots, well pinched, and grown in the cool conditions, outdoors in the Bay area of California. I can't recommend Annies Annuals enough. Real plant people who know what they are growing, many unusual or old fashioned plants found no where else, and always grown without growth hormones, retardants or stimulants. 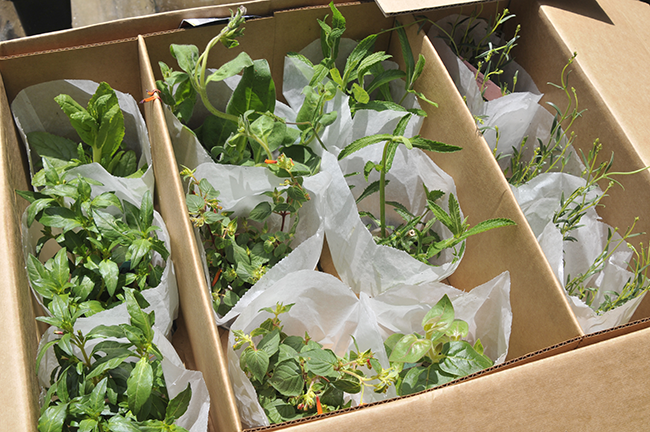 Check out the packing job on these perennials that arrived from another fav source of mine, Song Sparrow Nursery. 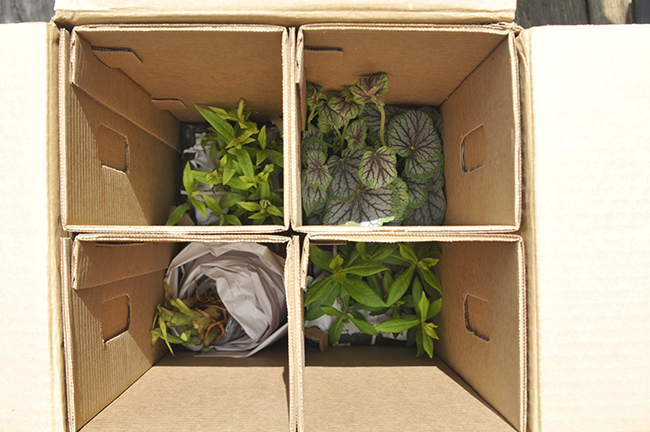 Each 2 quart nursery pot is fitted into cardboard wrap,, and each rectangular wrap fits tightly into a tall box. Just amazing. They are nice folks too, and if you are looking for a peony this fall ( which is when you plant them) be sure to check out their selection on-line, and order early. My grove of Betula chinensis 'cinnamon flake' birches also came from Song Sparrow. I am always impressed with their shrubs and trees, as each comes in its own box, which drives my UPS driver nutty, but hey - they are precious cargo. From Annies this year, I ordered many Cuphea species and named selections, just to try them in our New England garden, as I am well aware that not everything from Annies will grow well for us here in the hot and humid Northeast, but one never knows when a cool, breezy summer may come, and besides, I usually back myself up with some dry-loving desert friendly plants for my dry spots in the front garden. Annies has something for everyone, and they can make a sweet pea or even a common snapdragon look like an expensive, well grown perennial, so don't scoff at the prices - you'll be surprised at what one pot will look like. Here is my cart from last weekends' trip to Trade Secrets. Full of treasures. An 18" tall variegated Ajuga? You be. This ajuga challenges our notions about any ajuga being planted in a garden. 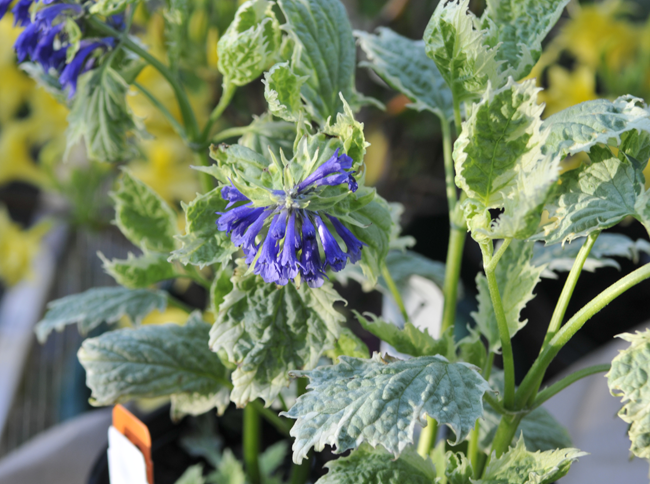 Ajuga incisa 'Frosted Jade' , from Broken Arrow Nursery, had many of us talking. A non-spreading, tall growing relative of a garden plant few of us ever think of actually introducing back into the garden. 'Rising Cloud' Redbud. 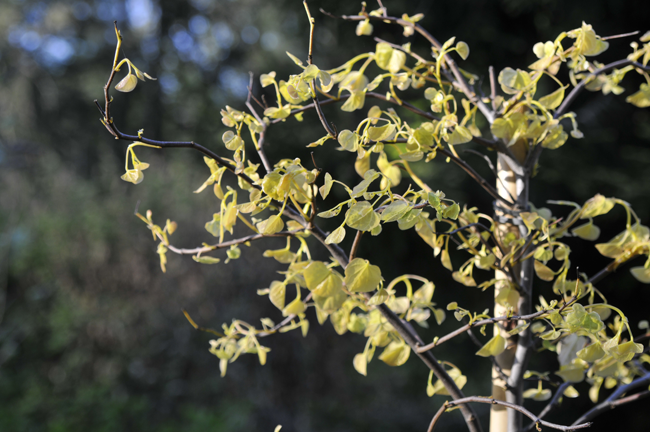 a golden leaved form with rosy pink new growth. I can't wait. Thank you Broken Arrow! 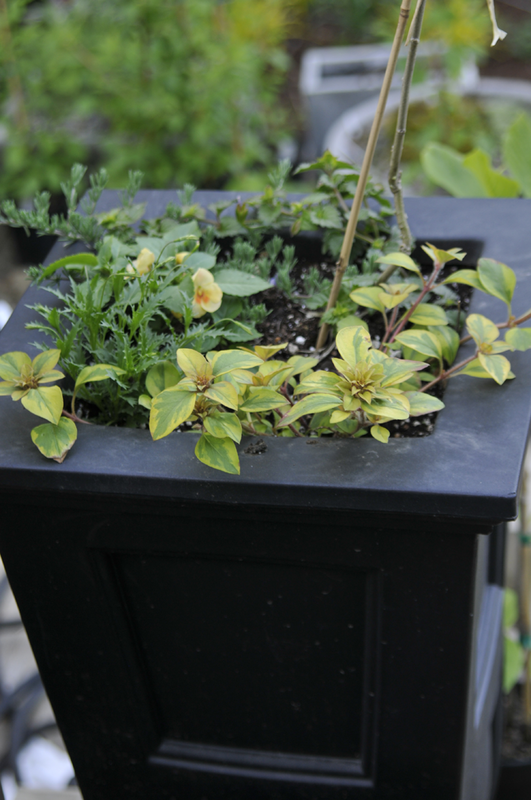 I thought that I would share some of the containers that I am planting. This pair of tall containers has a selection of Proven Winners plants that caught my eye. I always find that the Proven Winners selections over-perform ( in a good way), and although I am not a spokesperson for them, I support their breeding and marketing efforts, especially for inexperienced or new gardeners, as they do perform exceptionally well. While driving to the plant sale last weekend, I was thinking about what plant I would hope that I would find, and this is one that had been on my wish list for three years now . 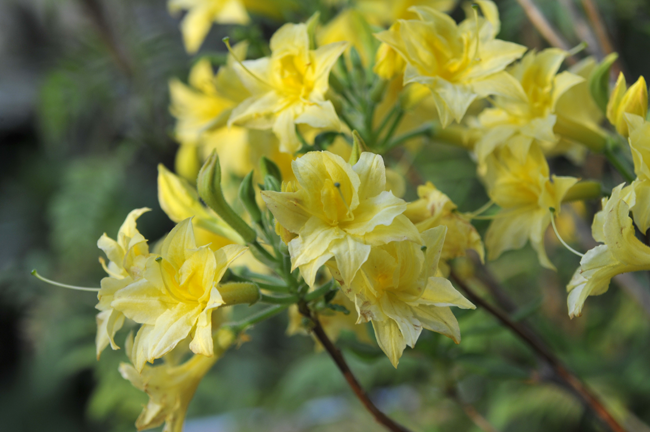 Rhododendron narcissiflora, a fragrant, deciduous azalea that I first saw at the Tower Hill Botanic Garden, where they have a magnificent mature specimen planted in their garden. It blooms earlier than most native species, and makes a large, well-branched shrub. 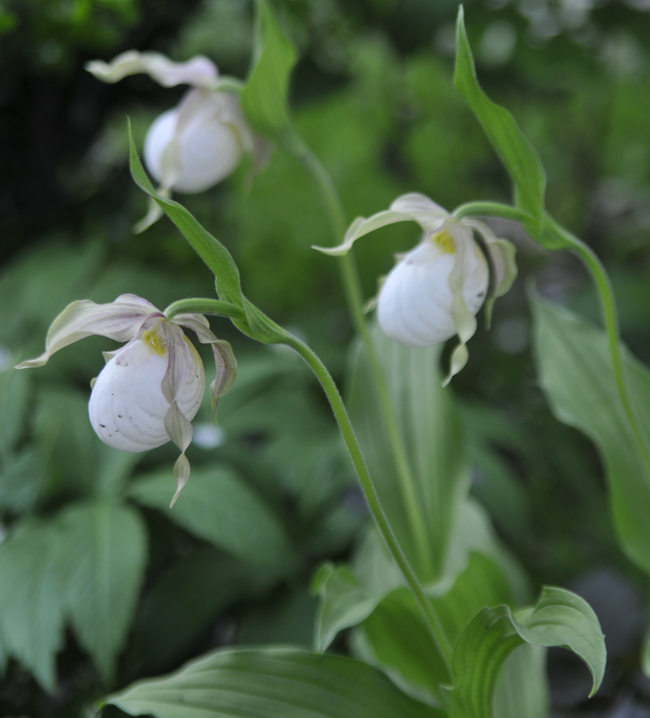 Cypripedium 'Sabine Pastel' blooming now in our woodland garden. These new ladyslippers by Frosch are easier to grow, but still require the perfect site, and they demand care while establishing themselves. Now in its third year, this plant finally seems to have taken off ( after losing 2 others!). Can you tell that I love May? Here are a few images from around the garden today. Be sure to check out the fighting Baltimore Orioles. 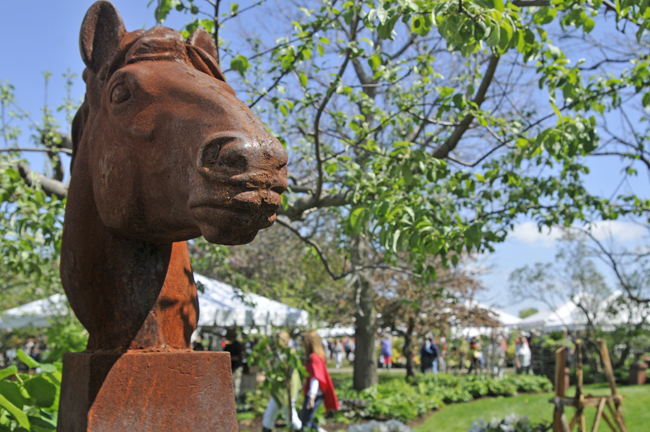 A pair of antique rusty equine busts are just an example of the quality of antiques and treasures to be found at Trade Secrets, a 2 day rare plant and antiques event in north western CT. It's so indulgent, I admit it, but I can't help myself when it comes to attending such an event as Trade Secrets, a two-day show located in the garden and meadows of a private farm in undeniably posh, yet dare I say 'rural' northwestern Connecticut near the Massachusetts and New York state borders in the rolling foothills of the Berkshires. It's clearly the event which many feel is the place to-be-seen, where one can find a $300 topiary, a sculpted granite fox for that perfect "fox hunt' motif that you've been lusting for, or a classic tin barn sink complete with hand pump and hand-crafted porcelain knobs. A lovely day for socializing, meeting other plant people and for meeting many of you! Check out the great images from this very special annual event. Our Asian Pear trees are in full bloom, and just in time for our first day of warm temperatures, allowing the droves of honeybees to make a full days work more enjoyable. The experts say that what makes a blog successful is good, original content, and for a gardener who keeps a gardening blog, the month of May can sometimes provide so much content, that one can easily become overwhelmed. No worries, I am not overwhelmed (aside from some the cold weather, lack of free time, little if no help in the garden, and some serious elderly father issues that we must deal with this week )- as this seasonable cold, yet not freezing month of seasonal transition, is practically perfect. The sort of May that can actually make Californian gardeners envious. with our armloads of lilacs and fresh peonies, spring bulbs and woodland wildflower spectacle, and to top things off, the spring migratory songbirds are just arriving with enough new Warbler species, Orioles, Robins and thrushes to make the morning chorus at 4:00 almost unbearably melodic (almost). 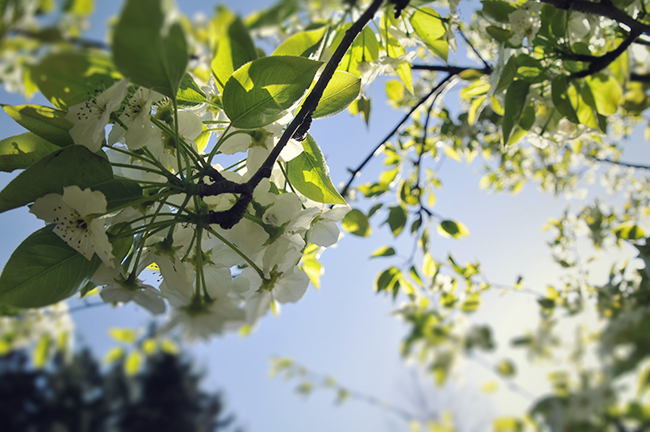 click below for more springness. 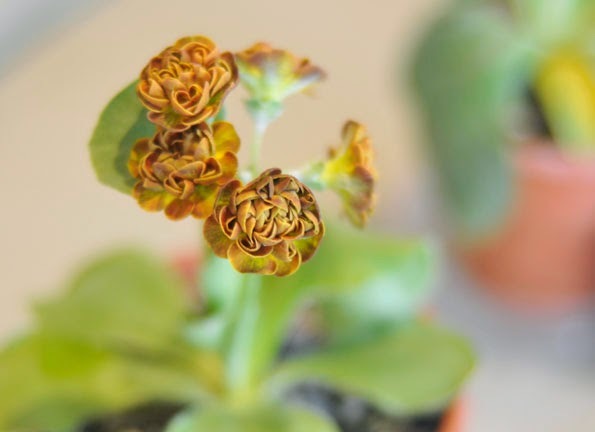 A LOVELY BRONZE AND COPPER COLORED DOUBLE AURICULA PRIMROSE GROWN BY JUDITH SELLERS AT THE NEW ENGLAND PRIMULA SHOW THIS PAST WEEKEND. I think that I've arrived at the conclusion that plant society people ( they are indeed a 'type') always complain about the weather. This past weekend I attended both the Seven States Daffodil Show and the New England Primula Society exhibition - held together at the Tower Hill Botanic Garden near my home in Boylston, MA. I am intimately involved with the primrose society, as many of you know, and, I do grow many greenhouse narcissus so the daffodil society is always on my radar (yes, I will join again someday, but not for a while - my pipeline for collecting plants is just maxed out, and I have to save SOMETHING for retirement). It's a slow spring, which is great, since many plants are staying in the greenhouse longer, giving me extra time to plant. A short post folks, as I know we are all busy with our personal lives, there are times when I get too caught up with deadlines too. I am moving offices at work, hosting an offsite with our My Little Pony team from the Hub and Hasbro (always great to meet with the director, writer and exec's from our LA studio and the Hub), healing an index finger infection from the alpine garden ( don't ask - but visualize that whale video on uTube when it pops and takes my nail with it), preparing a book proposal and hosting a bus load of New England Primula Society members for a garden party and cocktail party ( which, OK…. I had to cancel). Oh, and I closed on my other house ( which is on our property -yes I finally sold it - yay! ), and trying to basically just catch a breath between a long list of Powerpoint presentations including a board presentation to our local Botanic Garden on Sunday about the Future of Guest Experience, and 3 presentations for work about exciting stuff yet stuff I can't really share with you ( Oh Hasbro - sometimes you are like working for Google). You all deserve a blog post, so here are some pics from last Sunday which I've been meaning to share, and since it's been raining all week, a few other dreary photos from the garden since surely, you all are getting wet weather also. Even though we all may gripe and moan about how cool and wet it has been, the plants are certainly not complaining.